"In the beginning, God created Heaven and Earth...this is the planet Earth, newly born...the heat rises, meets the atmosphere...the restless seas rise..."
With a few sentences omitted for space, Jack Arnold's 1954 feature, Creature from the Black Lagoon begins with a narrator speaking the words displayed above. The ominous-toned speaker thus commences the film with an aura of grand eloquence, and more critically, a sense of context, history, and perspective. The voice-over narration reminds us that there is a connection -- a link -- between past and present, between the beginning of life on Earth, and the Anthropocene Epoch. This is an important point, because the film explores a clash between Ages, a clash which excavates not only the differences in life forms...but the similarities as well. 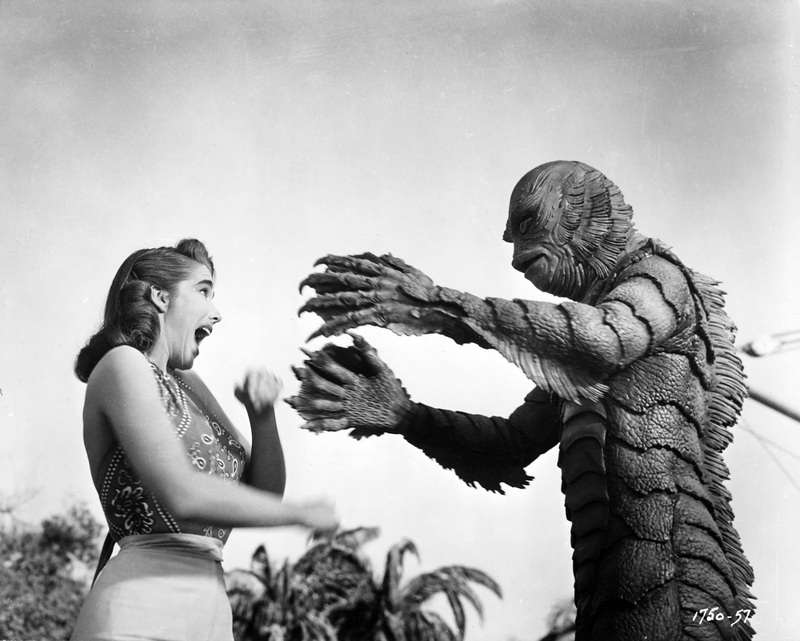 Creature from the Black Lagoon opens in the Amazon. A strangely human-like fossilized hand/wrist is discovered in the rocks by an archaeologist named Carl Maia (Antonio Morena). Hoping he has unearthed a previously unrecorded life-form - a missing link between life in the seas and life on land - he seeks the help of a friend, Dr. David Reed (Richard Carlson) at the nearby Instituto de Biologia Maritima. David and his beautiful girlfriend (also a scientist), Kay (Julia Adams) are intrigued by the discovery and petition their publicity-minded boss, Mark Williams (Richard Denny) to authorize an expedition. William agrees and they all head up the Amazon River on an old barge called the Rita. There, on a tributary leading to a black lagoon, a place that remains "exactly as it was 150 million years ago," the scientists confront the Gill Man: a strange life form that can move easily from the black depths of the water to dry land. 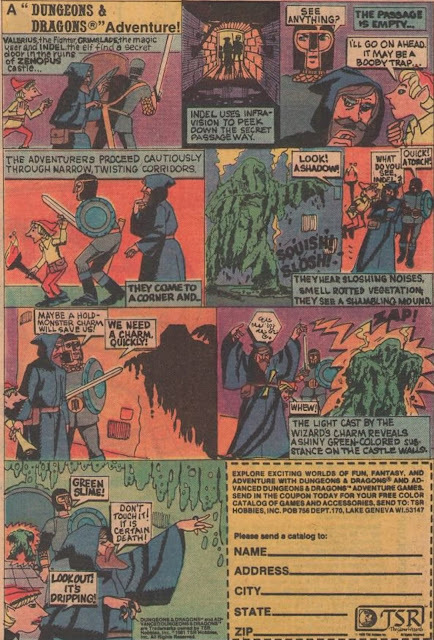 A battle is waged between Reed and Williams over how to handle the creature -- pure research vs. killing/capture -- and in the end, the hunt for the "monster" proves deadly to more than one crew-member. 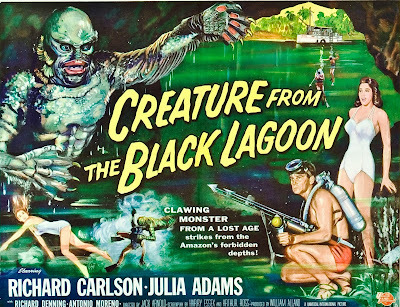 Though Creature from the Black Lagoon runs a scant eighty-something minutes, director Jack Arnold proves adept at finding the quickest, most efficient, and most cinematic way of expressing ideas and themes. In other words, his visuals pack maximum punch. Early on, for instance, it is necessary to introduce Reed, and Arnold does so by taking his camera straight down underwater, following a line of depth markers -- 20 feet, 25 feet, 30 feet, 35 feet -- all the way down until his camera lands on a busy swimmer: Reed, conducting research at the bottom of the sea. It would have been easier and much less costly, no doubt, simply to cut from the surface to Reed far below it, at the ocean floor, but instead -- and this is the essence of good dramatic filmmaking -- Arnold utilizes an unbroken, single shot that preserves space to reveal visually that David is a hands-on kind of guy, doing the difficult and dangerous work himself. We wouldn't have understood that facet of his character so quickly and so easily with a cut or a series of cuts, and so this unbroken shot not only establishes location, but also something important about the heroic quality of the lead. And indeed, when the film reaches its denouement, it is David out in the water clearing debris from the Rita's path, living up to his introductory scene, doing the difficult labor himself. Similarly, the long plunge down into the water to locate Reed visually reminds us of the gulf between land and sea; of the distance separating life in the two realms. As this is a key leitmotif in the film, Arnold's shot expresses this notion beautifully -- and simply -- as well. The underwater photography throughout Creature From the Black Lagoon is nothing less than extraordinary, and one classic sequence immediately jumps to mind. The lovely Julia Adams -- adorned in a white one-piece bathing suit -- swims across the black lagoon alone. Her shapely figure cuts the placid surface, and far below, in utter darkness, the creature mirrors her every move, entranced by her grace. There's much material of interest in this famous sequence, both thematically and visually. Since the gorgeous Adams is adorned in white, the traditional color of a wedding gown, it is easy to view her as the creature's intended bride. The Gill Man is tantalized by this visitor in his domain and keeps returning to the Rita not merely to kill crew-members, but to claim his beautiful prize, one senses. Furthermore, this relationship is viewed differently by each character during the swimming sequence. Kay believes she's swimming a solo and revels in her every graceful motion, but deep in the darkness below (a blackness opposite to Kay's shining white) the monster believes differently. He sees them as a duo, as partners sharing something special: a dance just for two. Perhaps this dance even reflects the creature's mating rituals in some fashion we can't understand. And as Kay spins sensuously in the water, the males in the audience no doubt sympathize and share the creature's longing for her. Why else the fascination with this movie monster over the years? He's a guy who doesn't get the girl,despite his deep desire for her, despite the fact that he is captivated by her beauty. Adams is quite an athletic beauty and there is an unfettered and uninhibited quality about the water dance she performs when Kay believes she's alone. 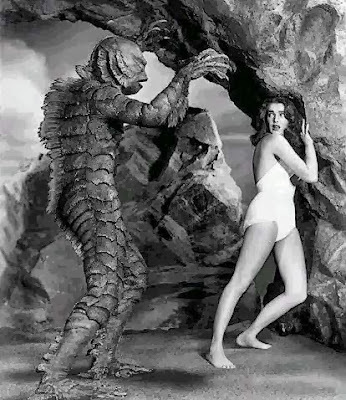 But then the scene ratchets up the suspense as the Gill Man -- no longer content to admire Kay from afar --moves in to touch her, his webbed hands growing ever closer to her kicking, dangling naked feet. Thus the Gill Man goes from an obsession with Kay to something much more dangerous: the need to possess her. Again, this is the dynamic of many a love relationship, isn't it? With an unrequited love leading to increasingly desperate behavior. In many regards, Kay is the film's central and most important character. 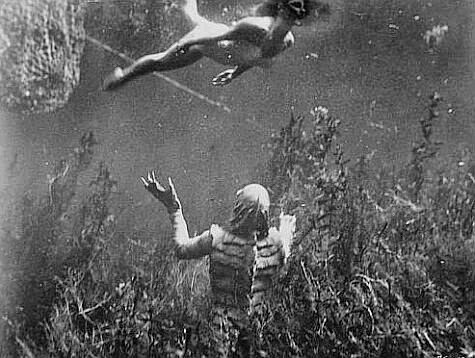 Every important conflict in Creature from the Black Lagoon involves possessing her, at least to some extent. She is the love object for not only the Gill Man, but for rivals Mark and David. Each of the three "men" in her life wants her for himself, and indeed, acts to win her. If you're so inclined, you can even look at these men as equaling a rough ladder of evolutionary development. On the bottom rung is the Gill Man, using brute force, murder, and killing to win his female prize and take her. Next up the ladder is Mark, who shows off his machismo with - ahem - a very large spear gun. Notice how he keeps drawing attention to the weapon, and wants so desperately to use it. He's a human male, unlike the Gill Man, but one still driven by such qualities as pride (the need to show off) and vanity (the need to prove to the world that he captured the creature). On the top rung of the movie's male characters is David. The most evolved of Kay's suitors, he demonstrates his respect for science and his opponent, and works for the communal good...knowing when to give up the hunt and seek escape. However -- finally and ultimately -- it is up to Kay to choose which kind of man she will favor (a demonstration of Darwin's survival of the fittest? ), and in a film about dead ends and blind alleys of evolution, this character dynamic represents a fascinating subtext, a mirror to the external adventure. For Kay will not merely decide which man to favor as her mate, but is also the most diplomatic and evolved of all the film's characters, a comment, perhaps, on women and the role they play in human civilization. Early on, Kay defends Mark to David. "Publicity brings endowments, and without money, there wouldn't be any research," she notes, explaining apparently indefensible behavior. In other words, it is the woman who is able to see all sides, to bridge the gap between evolved and un-evolved, and ultimately, that's why she's the film's most valuable prize. "There are many strange legends in the Amazon," a character in Creature from the Black Lagoon reminds us at one point. This film concerns the discovery of something legendary, something wild, and the need of the human race to understand and possess it, much as the men in the film seek to possess Kay. The film has maintained its popularity with horror fans over the years because, like King Kong, The Creature is thoroughly understandable and therefore thoroughly pitiable. He's a beast in love, and so we see something of ourselves in him. He may be a relic from a long-gone age, but the desire to love and be loved -- to procreate and thus attain the only immortality available to life forms on this mortal coil -- is universal. If you ask me, the real villain in the film is not the Gill Man, but Mark. The creature works by instinct alone, and who can blame him for that? David is evolved enough to let his intelligence and intellect dominate his choices and decisions. But Mark should know better than to pursue and kill that which he doesn't understand. Ultimately he pays for this mistake with his life. A man should be evolved enough to know that there are things in this universe that deserve better than to be trophies on a wall, whether it be a woman...or a creature from the black lagoon.